This book is an oldie but a goodie as it was published in the 1980's and it still has a strange ability to incite and absolutely haunting projection of what life in the future, particularly for women could be like. 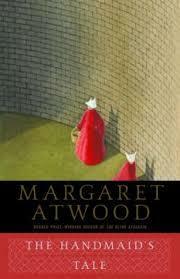 Essentially, the story is told from the viewpoint of Offred, a handmaid who is just one of a declining number of women who still have the ability to bear children. While nuclear disasters have affected health and fertility dramatically, Offred, like other handmaids who are still fertile, are removed from their homes, typical lives and families and are re-distributed within this patriarchal society to birth children for those who can't. Essentially, think a right-wing government which blames Islamic fundamentalists for terrorist attacks resulting in a suspension of certain human rights, while claiming it is doing so to protect the people from "heathen bastards." It would almost sound familiar to sound familiar to any left-wing American who has ever looked with a wary eye at the country's increasingly influential religious right. It's a creepy, very confronting look at how a fanatical right wing, heavily religious group could change societies structure. Certainly worth the read. It was made into a film a number of years ago but like most book adaptations, the film pales in comparison. The Following Season 3: what do you think will happen? Read one of her book's years' ago. Haven't bothered with any more. From reading each Review as published, they're not my 'cup of tea'. I love this book. Perhaps I should purchase a copy.